On November 27th and 28th, trance family members from all over the United States and the world descended upon the NOS Event Center to take part in the historic inaugural edition of Dreamstate. The Insomniac affair was the first festival in the country dedicated entirely to trance, and was a booming success. Though none of the sets were officially recorded, many of Dreamstate’s performers were taken aback by the display of passion by their fans and decided to re-record their live sets for personal enjoyment. 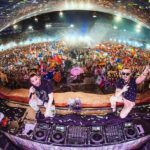 They following sets below include the likes of heavyweights Jordan Suckley, Aly & Fila, Paul Van Dyk, and Indecent Noise.